Šetřič obrazovky pochází původně z prostředí KDE jako kclock.kss, jehož autorem je Melchior Franz. 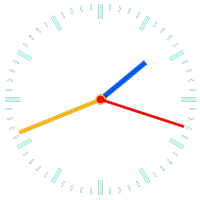 This is the kclock.kss KDE screensaver port to MS Windows. It is written in pure Qt4 without any KDE or libart dependency. It has some value-add features, so there is a linux backport available. Native English version and Czech translation is available, with run-time autodetection. It should be distributed under GPL.